Of all the Masters through the ages, there is one acknowledged Master who has been referred to in the ancient scriptures, in legends and mystic tales, in passing mention by many renowned masters. Mentioned in the Puranas and other scriptures, he is known as Guru Gorakhnath. The Nath Sampradaya, among many others, revere him as Shiva Goraksha. It is said that seeing Guru Gorakhnath in samadhi, Mata Parvati asked Lord Shiva about the yogi. Bhagwan Shankar or Lord Shiva stated that it was his own yogic manifestation. The Nine Naths and 84 Siddhas are aspects of Shiva himself,and legend suggests that they predate creation. 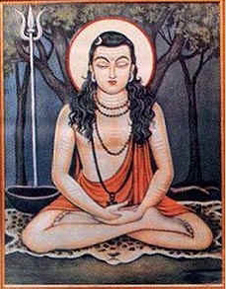 Shiva Gorakshanath is the founder of the Siddha tradition. There are innumerable legends about Guru Gorakhnath, though there are no records of when he was born, where he hails from, or any historical facts associated with events in his life. He is mentioned in reference to Adi Shankaracharya who lived in the eighth century. He is also associated with Kabir in the fifteenth century. Pandit Rajmani Tigunait referred to the divine birth of Guru Gorakhnath in his book, From Death to Birth. He wrote, "The eternal sage Narayana himself walks in the flesh in the form of Matsyendra Nath. Realising the depth of human ignorance and misery he resolved to help the human race through a beloved disciple who had already left his body and become one with universal consciousness." Among the many stories that abound, legend has it that as the eternal sage Matsyendranath walked through a village; he stopped at a house where he was given a meal. Blessing the woman who gave it, he said he would grant her any wish she had. When she mentioned that she was barren, he gave her some ash from the fire pit and told her to eat it. She rushed to tell her neighbours who ridiculed and cursed her. Afraid that they would now call her insane as well as barren, she threw the ash into the compost pit. Twelve years later, Matsyendranath decided to visit the child who was his eternal disciple. Visiting the same house, he asked for the boy and was surprised to hear that the woman did not have a child. He asked, "What happened to the ash?" Hearing that the woman had thrown it into the compost pit, he asked to be taken there. He called, "Alakh Niranjan" (one who cannot be seen nor tainted). A young boy emerged from the compost pit and bowing to his master walked away with him. He is believed to be the founder of the Nath Sampradaya and it is stated that the nine Naths and 84 Siddhas are all human forms created as yogic manifestations to spread the message of yoga and meditation to the world. It is they who reveal samadhi to mankind. It is widely believed that Guru Gorakhnath has been there for thousands of years, watching over the welfare of mankind from behind the scenes and occasionally appearing to accomplish a specific goal. Guru Gorakhnath is a legend in the world of everyday reality where logic prevails, where the senses determine the truth of existence and where reality is limited by the measurable. In the world of man he is spoken of in tones that vary from wonder and incredulity to sheer disbelief. Shri Shraddhanathji Maharaj followed this tradition of Nath Sampradaya as started by Guru Gorakhnath.